Quick. Easy. Light. Yummy. It makes me very happy when I can use all those words describe one single recipe. This is probably one of my favorite new recipe finds from last month’s Everyday Food. 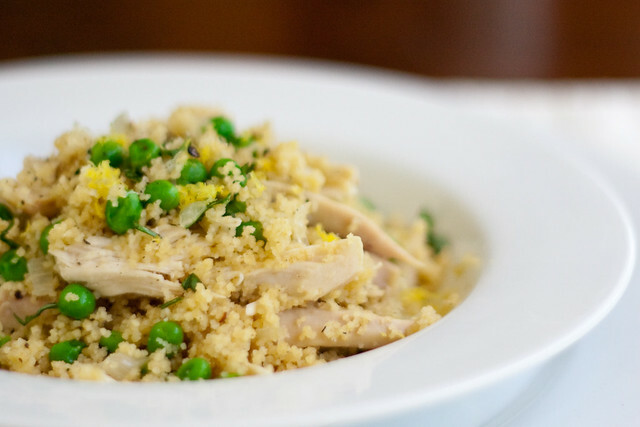 It tastes like spring in a bowl – the lemon, peas, and chicken are simple and fresh – and it is super quick, especially when you let the grocery store cook the chicken! The dish is easily adaptable to handle just about any vegetable you want to throw in to the pot. 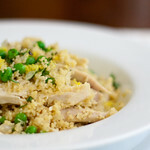 Simple and light with lemon, peas, and couscous. Skin and debone 1/2 a rotisserie chicken. Shred meat and set aside. Reserve any drippings from the carton. Heat butter and olive oil over medium-high heat. Add onion and cook until softened. Stir in garlic and cook 1 minute. Add broth and drippings to pan and bring to boil. Stir in lemon peel and peas and return to a boil. Stir in couscous and stir and add chicken. Cover and turn off heat. Let sit for 7 minutes. Add lemon juice and salt & pepper to taste. Fluff with a fork. Divide into bowls and serve garnished with parsley and additional lemon zest. I have this one marked to try! I’m so glad you liked it and reviewed it! I love simple dishes like that this that taste good, are healthy, and look so damn pretty! yum!! i can’t wait to try it! Thanks – this looks great! This is just the kind of dinner my boyfriend and I would love. I can’t wait to make it for us! That looks so simple and at the same time healthy! Great recipe. Mm. I made this last night as a round 2 recipe from Annie’s Lemon Chicken. http://annies-eats.com/2010/04/15/lemon-chicken/. It was SO delicious! Thanks for sharing! I just made this for dinner, it was so quick to make and tastes SO good. I topped it with some leftover feta and it’s amazing. My boyfriend it raving. I’m going to make this over and over! is there a way to make this without butter or oil or drippins and using a regular chicken breast instead of greasy rotissere chicken? You could probably use non-stick spray to saute the onions and garlic. The drippings bring flavor to the couscous so you’ll want to make up for that, by either using chicken stock (more flavorful than broth) and maybe extra lemon juice. Love this! You’ve incorporated everything delicious! What a simple, healthy and really yummy dish!